Fall and spring are my favorites times of year….why?? Because I, Kathi Kerr, owner and founder of Melody Music Studios, get to leave my office and travel to cities across the county to meet my staff of instructors and watch their students perform. It’s great to see the results of the students’ hard work and discipline. I also enjoy seeing the students have a great time showing family and friends what they’ve accomplished! That’s what music recitals are all about!. And for me, the icing on the cake is to see my staff and students in person. Over the years, I’ve had the chance to watch the same students perform, and watch how he/she has grown, both musically, and in their confidence as they begin to master their skills of music. 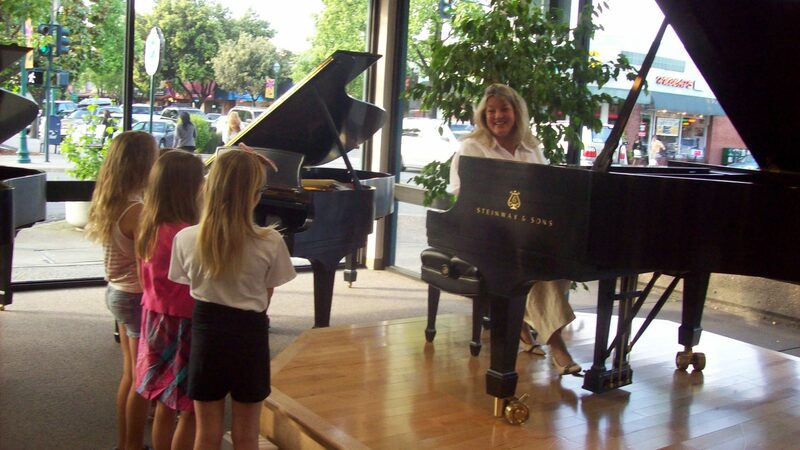 As I always tell my students, if learning to sing or play an instrument was easy, EVERYONE would be a musician. But it isn’t easy, and it takes time, endurance, patience, and perseverance, to master an instrument or to sing. So music recitals are what I call the “pat on the back” to show the student what a great job their doing. And because of that, music recitals are an important part of the entire musical education. It gives students a goal to work towards and motivates the student to practice. Sometimes that little extra motivation goes a long way. And when the student gets a feel for success, that’s enough to push them through what feels like “tedious” practice sessions. I still remember times in my youth when I had a performance to practice for. It can make all the difference in motivation to practice. And the more a student practices, the better he or she will be, and the better he/she is, the more FUN it is to practice. It’s what I call the “snowball” effect. The more skill is developed, the more “fun” it is to play or practice, and in turn gives the student more motivation to practice. It’s a “good” cycle. Although most of the students are children that perform in our recitals, we also have adult students that perform as well. I especially enjoy having the adult students showcase their songs, and I believe their performance helps to motivate other adults to take lessons. Often when adults call about signing up for music lessons, they’re first question is if we even offer lessons for adults. My quirky answer is, “of course, anyone under the age of 99!” Music lessons are not only for kids, but is a great thing for adults no matter their goal. Most adult students just want to enjoy learning music, and at Melody Music Studios, we’re happy to offer that. Then at recital time, I love to see their performance, and know that what we offering is making a real difference in their lives. So keep on going students of all ages, and don’t give up! It will pay off in your life, no matter what you choose for a career, or what your goal in life may be. If music is your choice, this is a great way to get started. But even if you don’t choose to be a musician or music teacher, you’ll have a life time skill of enjoyment as you come home from a hard day’s work and sing or play your favorite song! Music is the color in a person’s life, that is otherwise only black and white. Previous PostPrev Article Enter assistant Jaella! Next PostNext Article Gift Certificates for Music Lessons!